The mother-daughter team of Ines Di Santo designs Wedding Dresses for every type of bride. “I travel around the world meeting brides and what they dream of is so varied,” Ines said. “People can expect to see a collection emerged from my respect for the spirit and style of today’s lovely brides.” Her daughter, Veronica, grew up in the atelier and inherited the same passion as her mother. She mixes her mother’s classic look with unexpected twists, like pastels, which you can find in this collection of Wedding Dresses. “For this collection I was inspired by exquisite Parisian confections,” Di Santo said. You’ll find white and ivory mixed with a soft and sweet color palette of pastel pinks, purples and blues (even the models’ nails were painted these colors!). Full tulle skirts that as airy as cotton candy. The delicate textured embroidery found on the bodices is like the perfect topping found on the most delicious French dessert. What we’re really loving is the use of power blue in the collection: it’s different yet elegant for the bride who wants to combine unusual and traditional for her gown. 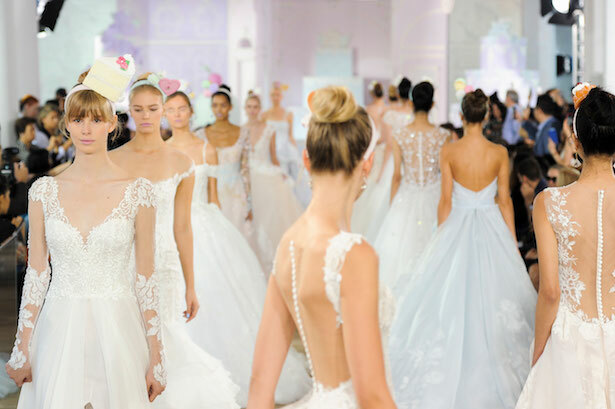 Take a look at Ines Di Santo’s Fall 2017 bridal collection—it really is a treat. “Valerie” Sleeveless soft tulle ball gown with scooped neckline, sheer illusion bodice and hand painted overlay embellished with beading.